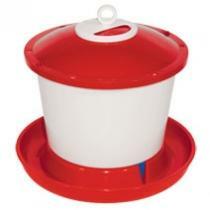 This 9 litre drinker is sturdy, stable and manufactured with non-toxic plastic material. It's innovative filling-up system means that it can be filled directly from above through the crescent in the cover. It has a handy hook for hanging the device, if necessary and the easily washable tank is white coloured to slow down algae formation. The automatic float assures optimal water level.